The book is in two sections. 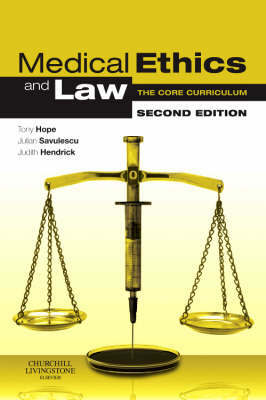 The first considers general aspects of ethics (in the context of medicine); the second section covers the topics identified in the 'consensus agreement'. The content of medical law is not intended to be comprehensive and relates very much to the ethical issues. The law will be updated throughout including: consent in light of Mental Capacity Act; mental health law in light of Mental Health Act; end of life (depending on outcome of Burke case and the passage of the Joffe Bill); assisted reproduction in light of expected changes in HFEA. New guidelines to be added: the guidelines and processes around medical research are under review and likely to develop and change; GMC guidelines are under continual revision (the Burke case in particular may have direct impact, but it is also likely that the confidentiality guidelines will undergo revision particularly in view of the increasing importance of genetic data). The new legal aspects outlined above will require some changes to the ethical analysis: the ethical issues of new technology will be included (cloning; transgenesis and chimera, i.e. forming organisms from more than one species) and stem-cells; resource allocation ethics is moving on to examining a wider range of issues than covered in the first edition and this will be discussed; the whole area of mental disorder and capacity to consent is an active area of ethical research and the second edition would cover some of this new work.